The secrets of the Unova region are now yours to command! In the Pokemon TCG: Black & White-Emerging Powers expansion, astonishing new Pokemon are available for the very first time, including the rare and powerful Legendary Pokemon Cobalion, Virizion, Terrakion, Thundurus, and Tornadus! With brand-new Item cards to revitalize your deck, the Black & White-Emerging Powers expansion offers Trainers all of the amazing new strategies of Unova!The Pokemon TCG: Black & White-Emerging Powers expansion contains over 90 cards.. More than 25 newly discovered Pokemon from the Unova region!. Two new PCDs built around the Pokemon Scolipede and Krookodile!. Full-card art cards of the Legendary Pokemon Thundurus and Tornadus!. Brand-new Item and Supporter cards!. 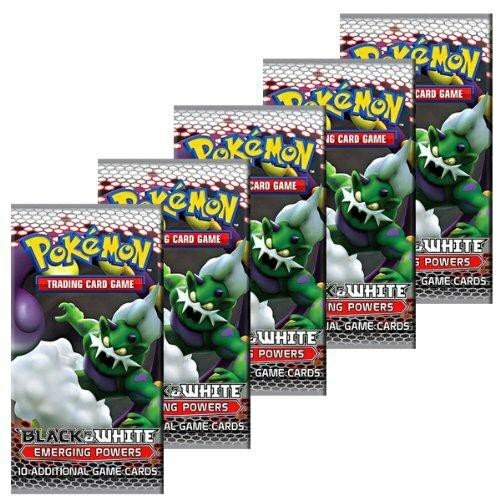 The Pokemon TCG: Black & White-Emerging Powers expansion contains over 90 cards! If you have any questions about this product by Pokémon, contact us by completing and submitting the form below. If you are looking for a specif part number, please include it with your message. 100 Pokemon Card Lot With 2 Legendary EX Ultra Rares! Foils - Rares - Energy! Comes in Empty Elite Trainer Box For Storage! Includes Golden Groundhog Box! Pokemon 50 Random Card Lot Guranteed 5 RARE, HOLO, OR EX! Pokemon TCG : 100 CARD LOT RARE, COMMON, UNC, HOLO & GUARANTEED EX CARD + 10 FREE CARDS!! !